I have a weakness with melted cheese. I’d eat melted cheese on paper. 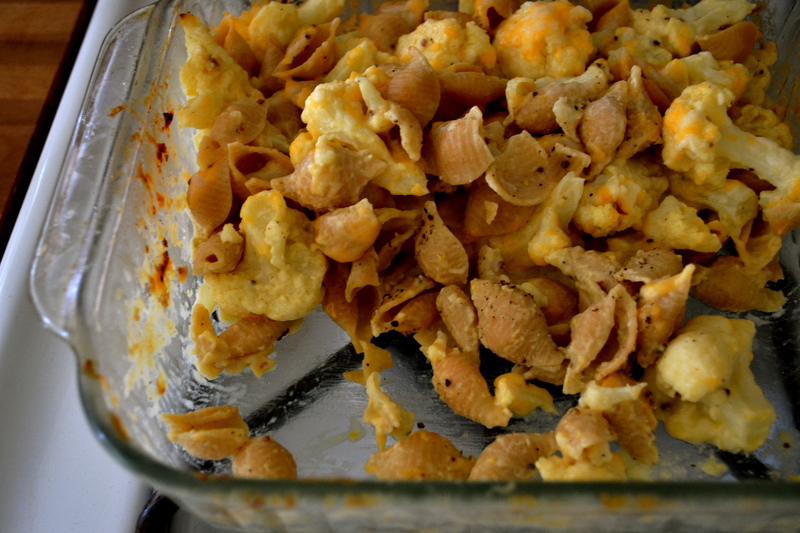 That might not be the best thing to tell you when I try to sell this latest cheesy casserole adventure to you, because it tastes awesome…and I swear there is no paper in it, just cauliflower. In college, I used to eat way too much of the boxed variety of mac and cheese. Bleh…and the homemade variety is usually so laden with a literal ton of cheese, that my heart hurts for days. So, I had pretty much sworn away from the dish, until this weekend. Although I am a big fan of sneaking veggies into dishes at all times, I have never been a big cauliflower lover (Ear muffs, Mr Cauliflower). I don’t know, maybe I’m not drawn to it at the market because it is all white and always outshined by the bright orange sweet potatoes, the deep green kale, kaleidoscope orange and red and yellow chard, or the brilliant purple and white striped eggplants. But now I feel bad that I have left the poor cauliflower out of my vegetable obsessions…merely because it lacks color. So I decided to include the often forgotten cauliflower in a cheesy mac and cheese dish inspired by recipes from Vegetarian Times and Runner’s World. Like all things american…if you don’t like it, simply smother it in either butter or cheese. Voila! But honestly folks, that isn’t the intention with this healthy dish. Cauliflower doesn’t get mushy like broccolie and adds a good firm contrast to the gooey cheese and soft noodles. You could leave the noodles out and make just a cauliflower gratin, if you wanted. The cheese sauce is basically a bechemel sauce (butter, flour, and milk) with raw milk sharp cheddar and parmesan added. The key ingredient for me in this whole dish is smoked paprika (not plain or sweet hungarian paprika…smoked). You can find it in most grocer stores or speacialty shops. The smokiness adds a great layer of flavor without adding bacon (gasp, i know). Preheat oven to 350 F. Spray an 8X8 pyrex with nonstick spray. Set aside. Cook pasta in medium pot according to package directions. Reserving 1/2 cup of liquid. 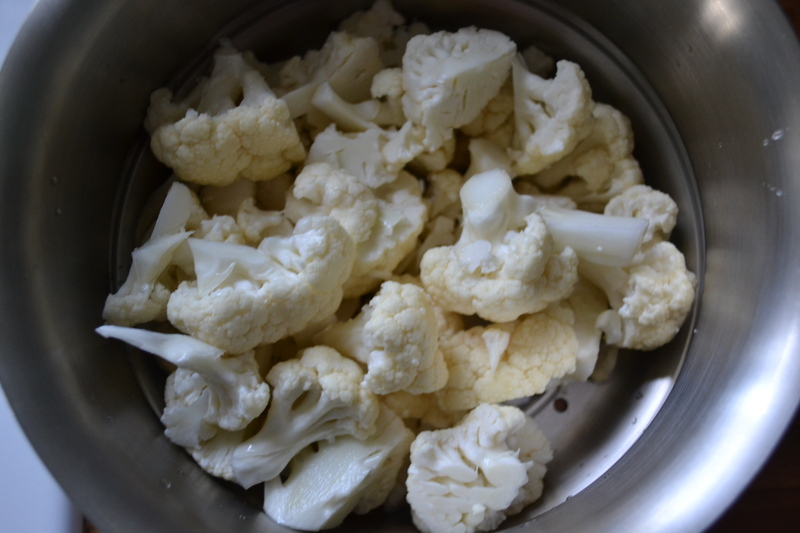 Steam cauliflower for 5 to 7 minutes. Cauliflower should be cooked, but firm and not mushy. In a medium saucepan, melt butter over medium heat. Once butter is melted, whisk in flour, stirring constantly. Cook on medium heat for 1 to 2 minutes, stirring constantly. Whisk in milk and reserved cooking liquid. Cook over medium heat for 7 to 10 minutes until thickened, stirring frequently to keep from burning. Remove sauce pan from heat. Stir in cheese, dijon mustard, paprika, salt, and pepper. Once cheese is melted, stir in beaten egg yolk. 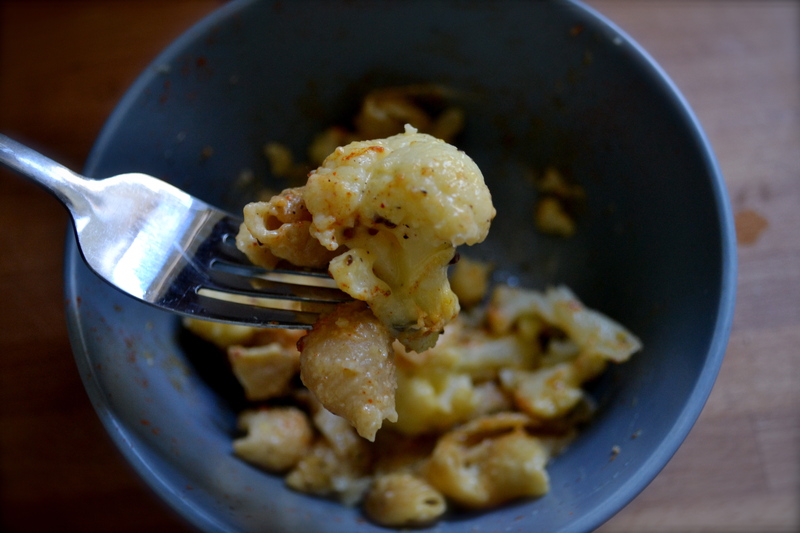 Toss steamed cauliflower and cooked pasta with cheese sauce. 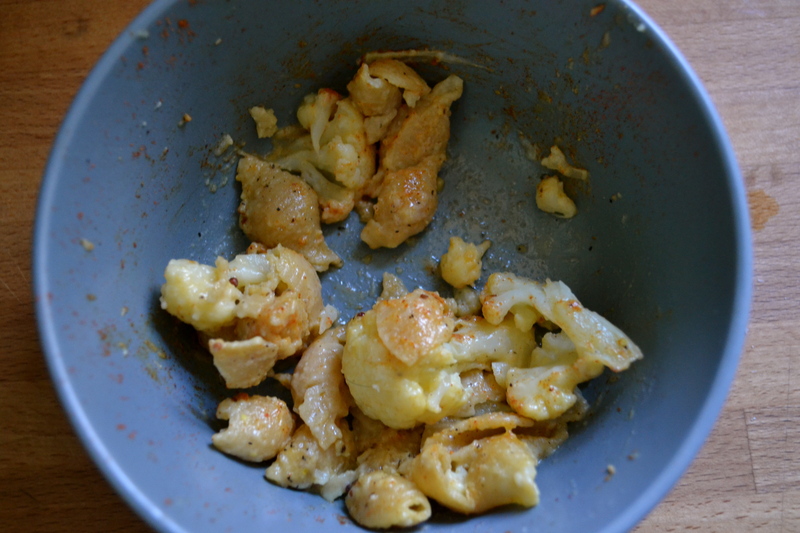 Pour cheesy cauliflower and pasta into sprayed 8X8 pan. Carefully place in oven. Bake for 20 to 30 minutes, or until top is lightly browned. Remove from oven and allow to cool for 5 minutes. Sprinkle lightly with smoked paprika. Oh maaaan…..I cannot wait to try this recipe. I’m freshly off my vegan diet and this sounds deeeeelish! This is the perfect cheese celebration. I love cauliflower and it really does pair so well with cheese. This looks like delish comfort food! I seriously learned to like cauliflower earlier this week, when I roasted it. I bet I’d love it smothered in cheese, too.